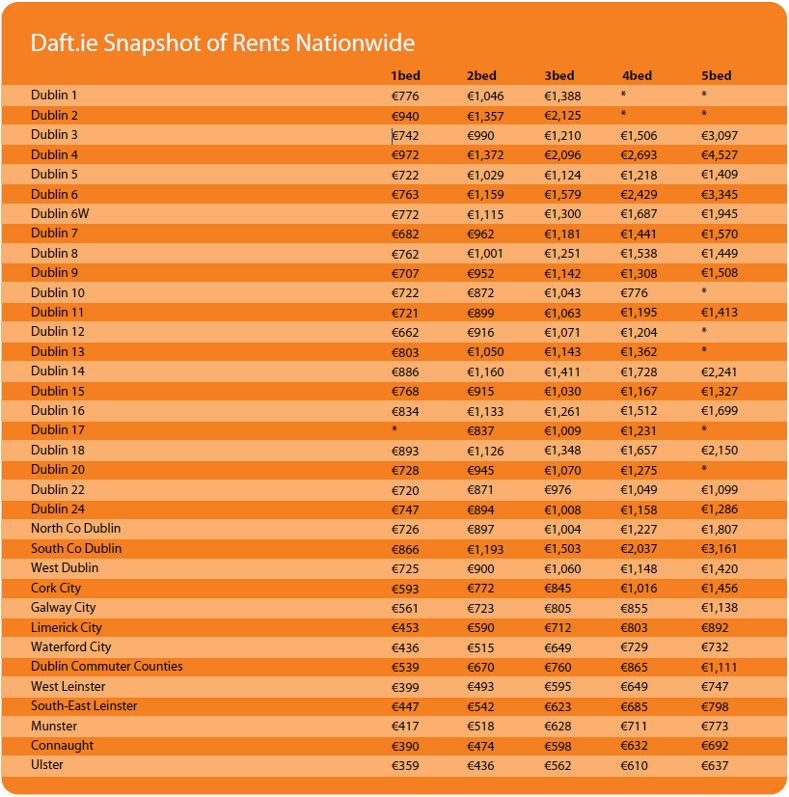 The results of the latest Daft.ie quarterly rental report illustrate how the property market is finally finding a floor and that is good news for the economy as a whole and for Foreign Direct Investment (FDI) into this country. Rents are stabilising nationally and even rising very modestly in some locations like Dublin and Cork as the sector recovers from a dramatic downward spiral which started in the latter half of 2007. Thankfully the trends suggest residential rental prices are stabilising around currently attractive levels, meaning that gains in competitiveness of recent years will be locked in. For example taking the country as a whole, rents actually fell slightly (0.7%) in April compared to the same period in 2011. There is a pronounced urban and rural divide in the latest figures, with the bigger cities like Dublin and Cork able to command a slight premium over other areas. 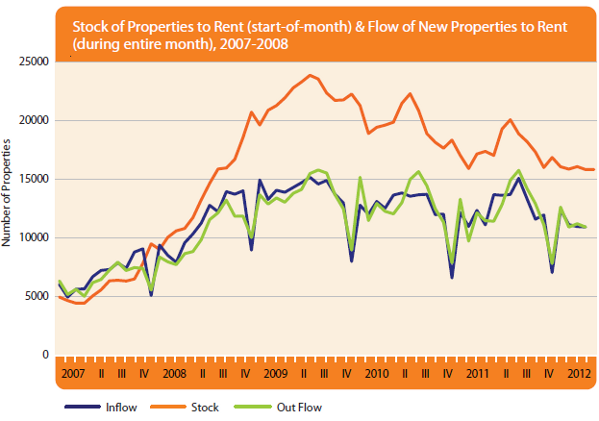 It appears that Ireland now has what it didn't have in the runaway years of the boom - a stable rental market. 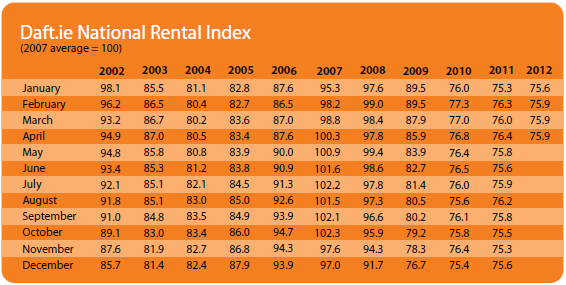 For example the Daft.ie rental index has remained at the same level for the last three months and it has barely changed since the start of the year. Even the number of properties available for renting has remained broadly in the same range. While there is concern among some property owners that rents and prices have not returned to boom levels, the market emerging from the economic crash appears more sustainable, which is something the IDA would always welcome. One of the factors helping to keep prices stable is the flow of FDI which has come into Ireland during 2011 and in the first four months of this year. The creation of jobs at leading companies like Eli Lilly, Microsoft, Cisco, Mastercard, PayPal, SAP, Mylan and Amgen creates strong demand in the private rented sector from employees of these companies. Many of the staff who work for these leading firms are young and they often prefer to rent rather than buy, providing a valuable income stream for those who rent out accommodation, particularly apartments in urban locations. IDA Ireland is glad to see that Ireland is now very much a value location. At the tail end of the boom costs here were becoming prohibitive for some potential FDI clients, but now Ireland is marketing itself as a value location, not just in terms of property, but also in terms of people costs, energy costs and infrastructure costs. Our FDI clients are making huge capital investment decisions in favour of Ireland and we recently calculated that just 10 IDA client companies alone would require over 1.5m square feet, predominantly for manufacturing. We estimate this will lead to a need for 1,500 construction workers over approximately 2 years. The new buildings are required for the life sciences, ICT and data centre sectors. This is separate from the take up of office space by other IDA clients in Ireland in recent times. Property solutions are integral to Ireland winning its fair share of FDI business, and Ireland gets a very high share of FDI when one considers the size of the country. As a result this organsiation works closely with bodies like NAMA and the local authorities on designing property solutions for current FDI investors and potential FDI investors. For example at a senior level we work closely with NAMA on accessing potential sites for FDI projects. Clearly companies of global importance who come to Ireland (or who are already here) have specific requirements for high spec buildings of large scale. The property development and construction industries now face a challenge to come up with imaginative ways to meet this demand. After the difficult years of the economic downturn, the property development industry is now hungry again for growth and expansion. Working closely with partners like IDA, the industry should be able to benefit from the strong flows of FDI which have come into Ireland in recent times.